Following an update of a SQL 2005 SSRS server to SP4 + all Windows Updates, the SSRS service would not start. “Report Server (MSSQLSERVER) cannot connect to the report server database.” was logged in the Application Event Log. 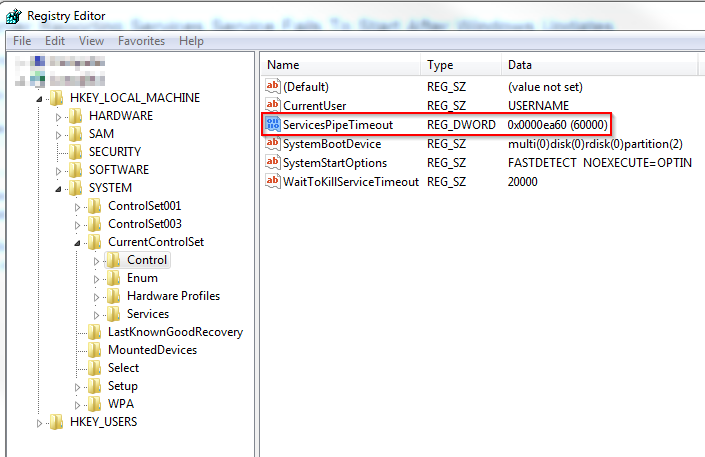 “Timeout (30000 milliseconds) waiting for the SQL Server Reporting Services (MSSQLSERVER) service to connect.” was logged in the System Event Log. The resolution was to update the HKEY_LOCAL_MACHINE\SYSTEM\CurrentControlSet\Control\ServicesPipeTimeout registry key to 60000. This increases the time allowed for a service to start from 30 seconds, to 60 seconds. In my case the registry key didn’t exist so I had to create it. Once the registry has been updated/created reboot the server. This entry was posted in SQL Server and tagged SQL Server Reporting Services, SSRS, Windows Update on March 21, 2013 by richardstk.